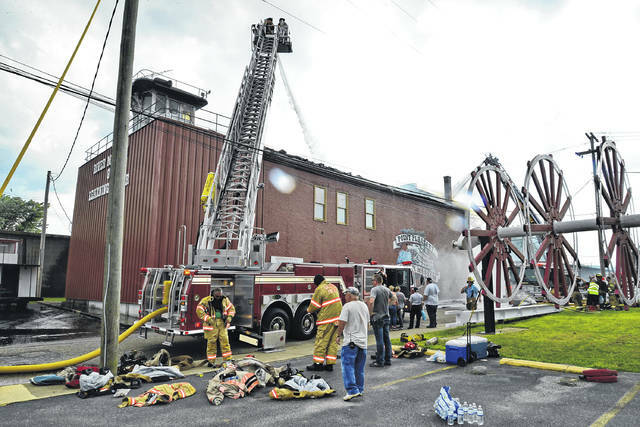 Firefighters from numerous departments were on the scene of a fire at the Point Pleasant River Museum on Sunday afternoon and evening. A firefighter at the top of a ladder truck sprays water into the River Museum in an effort to put out the fire on Sunday evening. Firefighters work to put out the fire at the Point Pleasant River Museum on Sunday afternoon. Damages from inside the Point Pleasant River Museum. Several individuals have been helping with the clean up of the Point Pleasant River Museum. POINT PLEASANT — This past Sunday, the Point Pleasant River Museum was having a regular day with its staff and approximately 17 visitors until the smoke detector sounded. Jack Fowler, Point Pleasant River Museum director, reported he was in the simulation room at the time the fire began. 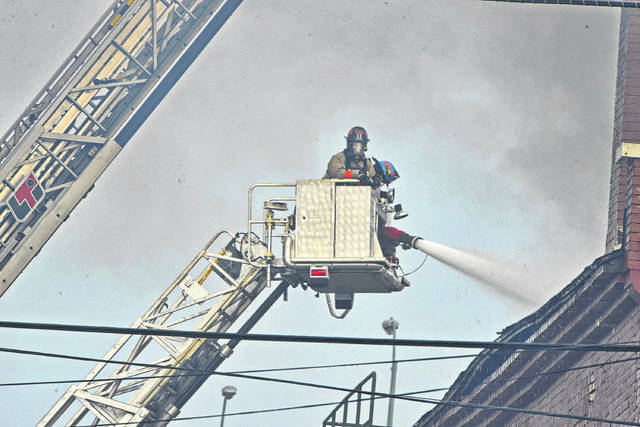 Fowler explained he and others who were inside the building attempted to extinguish the fire themselves, but could not. After smoke started billowing out, the local fire department was contacted and everyone inside the river museum evacuated. The Point Pleasant Fire Department (PPFD) Fire Chief JR Spencer reported at 2:25 p.m. the call came in reporting the fire at the river museum. The call generated over 100 responders to the scene. Area local fire departments such as Gallipolis FD, Mason FD, New Haven FD, Flatrock FD, Leon FD, Valley FD, Middleport FD, and Pomeroy FD responded to the scene to help alongside the PPFD as well as the Point Pleasant City Police and Mason County Sheriff’s Department, Mason County EMS, and Mason County Office of Homeland Security. Spencer said the fire originated in the attic of the building. 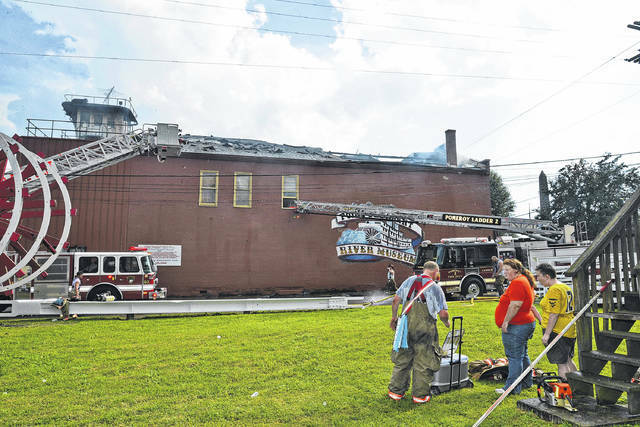 He explained the cause of the fire is still undetermined, but is being investigated by the West Virginia State Fire Marshal’s Office. 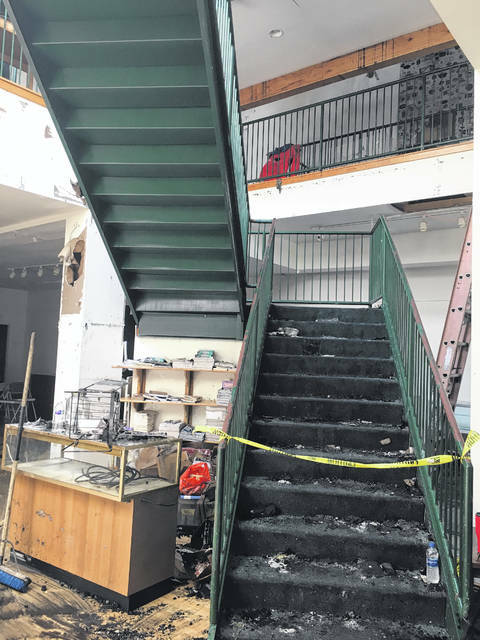 “There was heavy damage throughout the building, damage by actual flame was limited to the attic/second floor area, but both floors suffered heat, smoke, and water damage,” said Spencer. Spencer explained many items were removed during the fire. Fowler said between 60-70 percent of the items within the river museum were salvaged. Both Spencer and Fowler commented on how crucial the help from the community was during this ordeal. Members of the community helped remove items from the river museum. They extended appreciation to workers from the City of Point Pleasant, Mayor Brian Billings, Mason County Commission members, local marine companies, and many others who have given assistance during this ordeal. Spencer reported he had one firefighter who had to be transported to the emergency room for heat related illness and several other individuals had to be treated on scene. Fowler explained as of right now the focus is cleaning the river museum and its items. Following, an appraisal will need to be done and an engineer will need to come into the river museum and assess the damages. Items that are needing cleaned are being taken to the Point Pleasant Youth Center and the dry items are being taken to the K.V.C building where Fowler and river museum workers Ruth and Martha Fout will be located for the time being. Fowler reminds that the Belle of Cincinnati event is coming up on July 30 and all proceeds from this event go to the river museum. Also, the upcoming annual Tribute to the River supports the river museum. Fowler explained the river museum will receive insurance payment, but rebuilding will be a costly matter and he hopes people will have a warm spot in their hearts for the river museum and help now in its time of need. 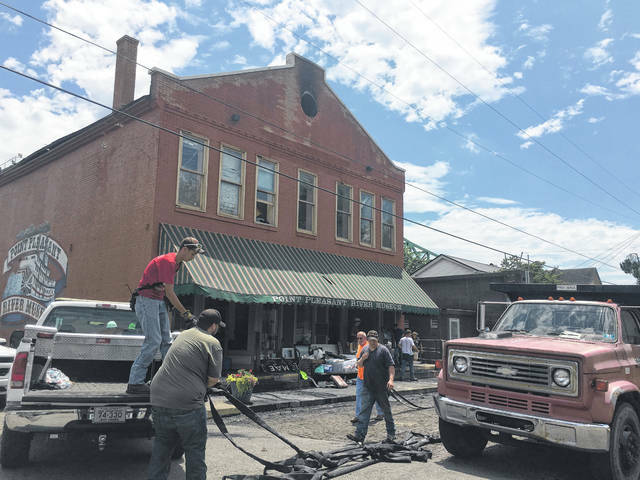 For anyone wishing to make a monetary donation, an account has been opened at the Ohio Valley Bank Point Pleasant branch called the River Museum Rebuild Fund. The fund is also on Facebook, https://www.gofundme.com/river-museum-fire-recovery-fund. For anyone wishing to help with cleaning, individuals are meeting at the Point Pleasant Youth Center at 9 a.m., Tuesday. Commissioner Rick Handley advises those coming to clean to bring paper towels and window cleaner with them.